This features Depth Masking, Tilt, and Directional masking. Starting out with a bald head. 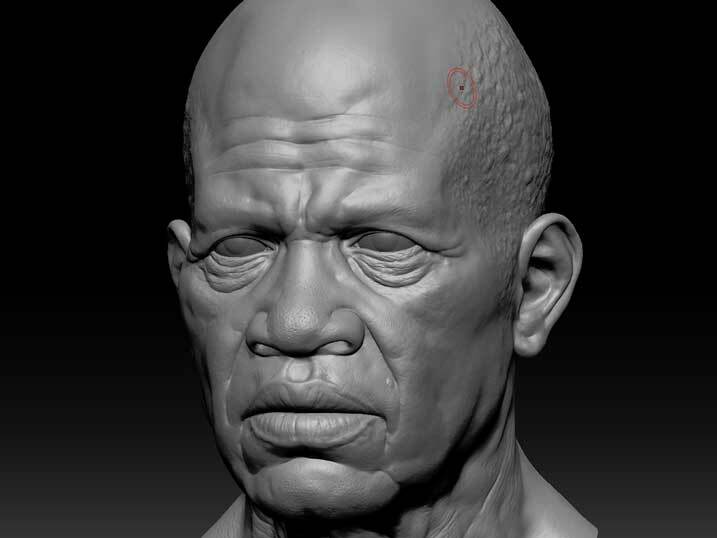 Select the ‘Clay’ brush and set the stroke to ‘Spray’ and load in ‘Alpha 21’. Turn on ‘LazyMouse’, located in the ‘Stroke’ palette and set the ‘LazyStep’ to 0.075. 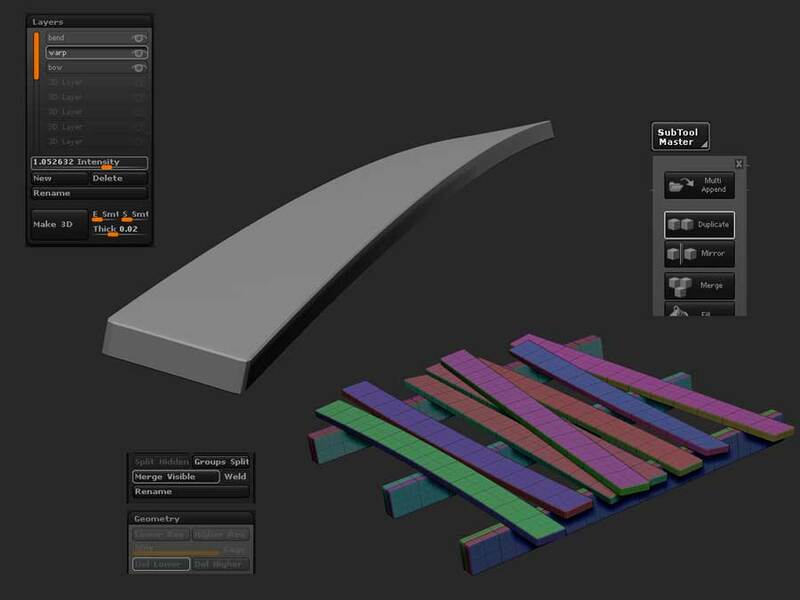 Dock the ‘Brush’ palette and under the ‘Depth’ tab set the ‘Depth Mask’ graph to look similar the one shown here. 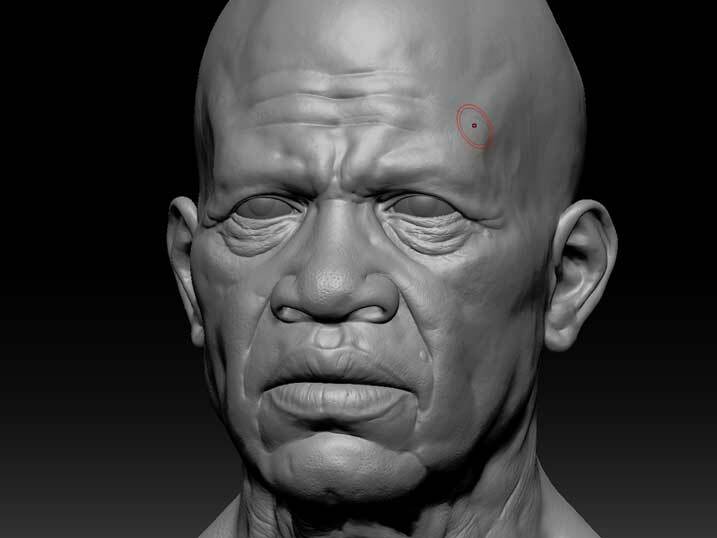 Under the ‘Modifiers’ tab, set the ‘Tilt Brush’ slider to a value of 50. Under the ‘Auto Masking’ tab, toggle on ‘Directional’. 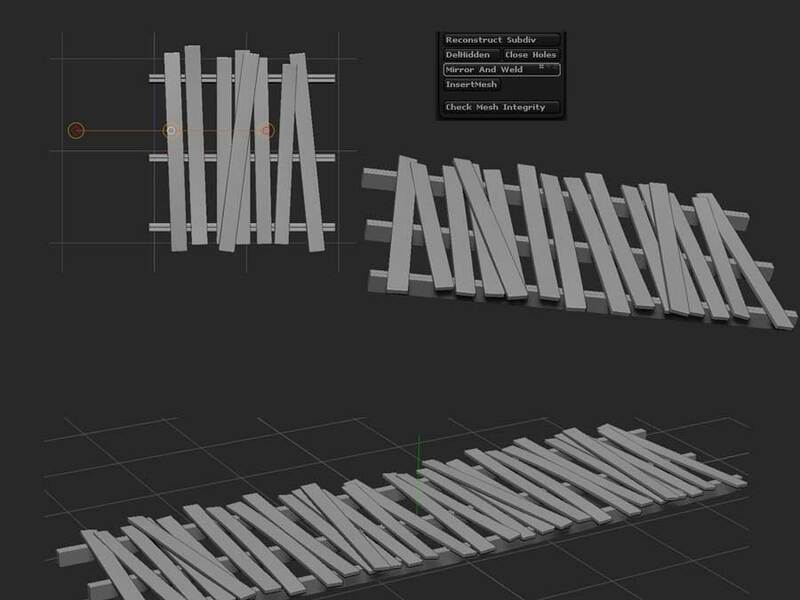 And finally, under the ‘Alpha and Texture’ tab, set the ‘AlphaTile’ slider to 5. Mask off the areas that you do not want hair and then begin stroking the fuzzy hair onto the surface. Try to build up some areas a little more than others to develop clumps of curls. You can also create the hair on a layer in order to have more control. This features Mirror and Weld, and Surface Noise. Start with making a board. Use a ‘Cube3D’ and set the initialize settings to match that of those in the following image. 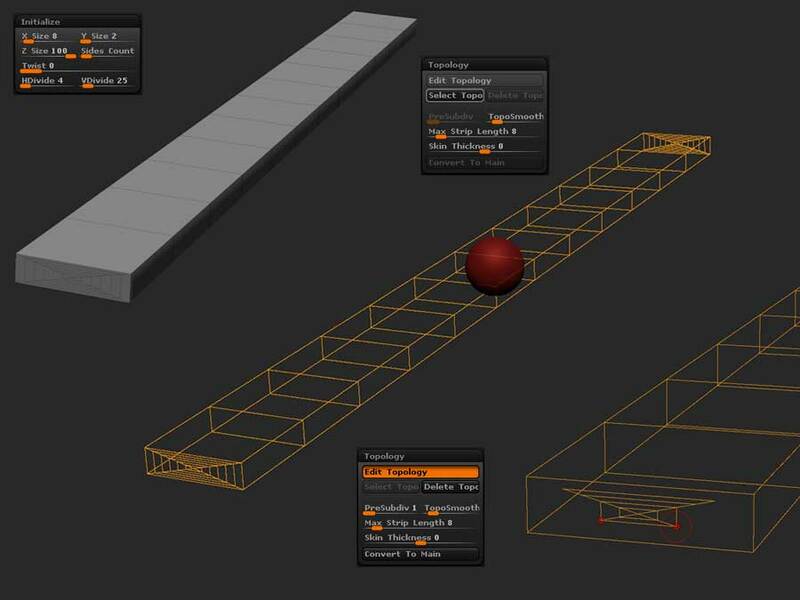 After you’ve set the intial settings, hit the ‘MakePolyMesh3D’ button. Grab a new Zsphere and go the ‘Topology’ tab, located in the ‘Tool’ palette. Click the ‘Select Topo’ button and select your previously created board. 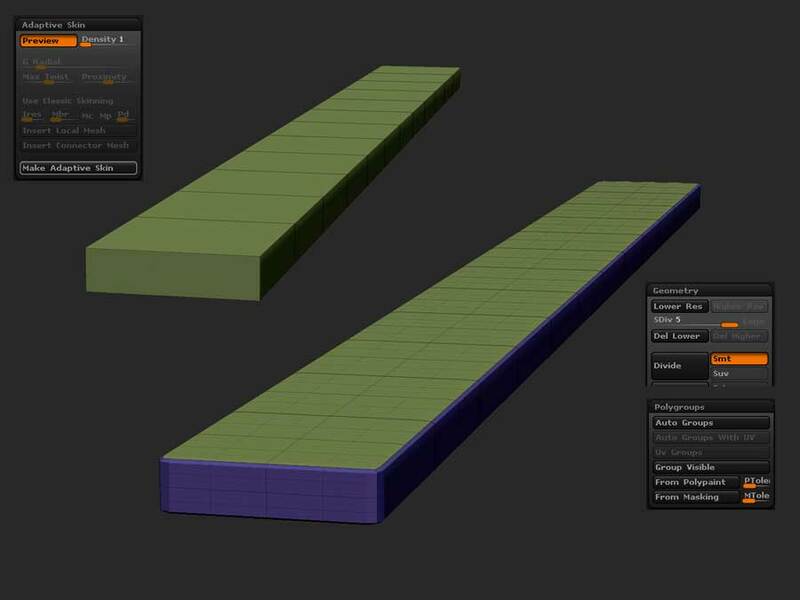 Now, hit the ‘Edit Topology’ button and use Alt+Click to remove the unwanted geo on each end of the board. 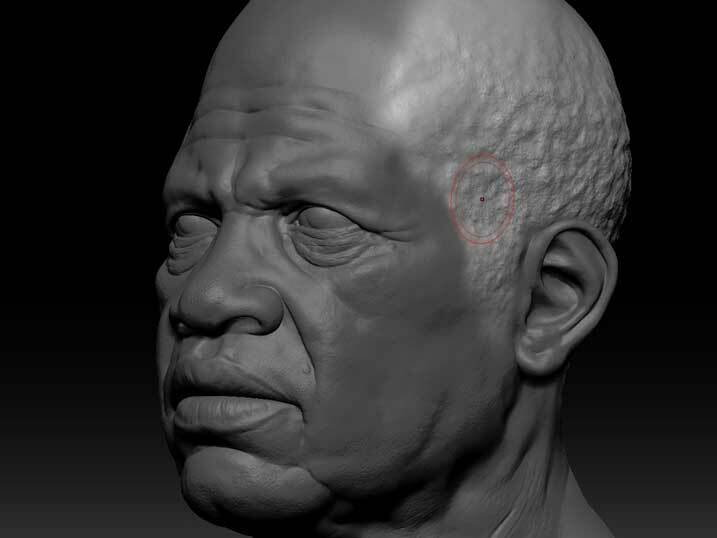 Convert the new topology back into a 3D mesh by creating an adative skin. You can also add in any polygrouping at this time. Next, add some layers for deforming the board. I added a bend, warp and bow layer using the the ‘Twist’ and ‘Gravity’ deformers in the ‘Deformation’ tab. Set each layer back to 0 once you are finished. Now you can duplicate and position the boards into the beginnings of a bridge or wood palette. Use your bend, warp and bow layers, along with rotate and scale to add variation to all the boards. When you have a small section that you are happy with, merge all the subtools into one and delete the lower subdivisions. Now, move the section off to one side of your grid and use the ‘Mirror and Weld’ button to extend the section into a bigger piece. You can get all kinds of different results simple by rotating or moving your current geo to different parts of the grid. This is very fast for blocking out concept scenes for a paintover, or for building up tons of scafolding on the side of a building, etc. 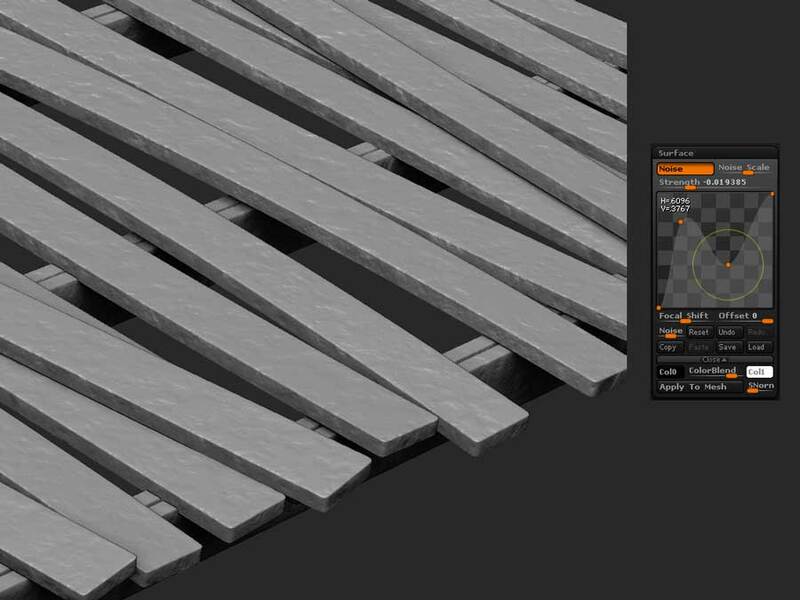 Finally, add some surface noise to the wood in order to help kick off the sculpting process.